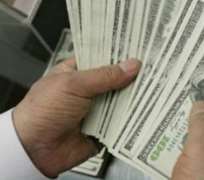 The United States government has introduced a newly designed $100 bill as part of its strategy to stay ahead of counterfeiting threats. The redesigned $100 note incorporates security features that make it easier to authenticate, but harder to replicate. This was disclosed to a select journalists across Africa in a teleconference, where Director of Banknotes/Chief Cashier at the Federal Reserve Board, Michael Lambert spoke from Washington on why the U.S. redesigned the $100 note that is currently circulating worldwide. According to Lambert, 'The redesigned $100 note includes two new security features: a blue 3-D security ribbon with images of bells and 100s, and a color-changing bell in an inkwell. The new features, and additional features retained from the previous design, such as a watermark, offer the public a simple way to visually authenticate the redesigned $100 note,' he said. Lambert advised that it is not necessary to change the old currency for a new one. 'There is absolutely no need to trade in older-design $100 notes for new ones. From our perspective, the notes are legal tender. The difference is in design. We will not recall them, we will not devalue them, and they will all be legal tender,' he explained. Lambert insisted that it is U.S. government policy that all designs of U.S. currency remain legal tender, regardless of when they were issued saying both old and new currency will continue in circulation concurrently. He told journalists during the teleconference that the new design is made with a technology that is so precise that will make it impossible to counterfeit the new note. 'The Federal Reserve, U.S. Department of the Treasury, U.S. Bureau of Engraving and Printing, and the U.S. Secret Service partner to redesign Federal Reserve notes to stay ahead of counterfeiting threats,' he noted. According to him, the new design cost 4.8 cent per note more than the old design because of the new technology used, adding that it took about 10 years of research to arrive at the new design.